Large stack bins stack on top of each other to utilize vertical storage in a small dorm room. Perfect for storing clothes, accessories, desk supplies, even snacks! Bins nest together when not in use for easy transport. When moving into your new dorm room you will see that college supplies that make your life easy are a necessity! Once you're set up in your dorm room you'll need unique college storage items to help you keep your dorm space organized. But with all of the dorm items you'll be bringing with you you may not want to have to make extra trips to get a bigger dorm storage item up to your dorm room. That is why the Large Stackable Dorm Storage (3 Bins) - Black is an essential college item. This handy college storage unit is easy to carry and easy to stack, making your college move in day a much simpler and quicker process! 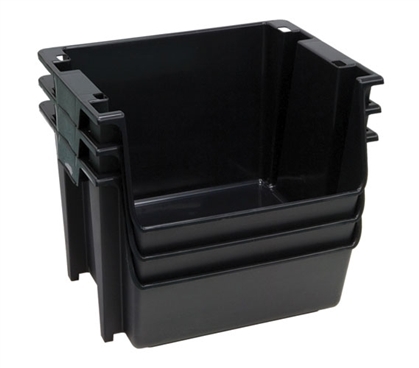 These one-of-a-kind black dorm storage bins are designed to stack inside one another when not in use, allowing you to easily carry them all at the same time. Once in your dorm room, just stack these college storage bins on top of each other and you quickly have vertical dorm storage that is key to a great looking dorm room. Vertical college storage takes up less space in your dorm room so you have more room for other college necessities like additional college seating or pieces of dorm decor. These black dorm bins are perfect for your clothes, other college supplies, and even snacks!